This conservation resource was created by Ferguson, Andy. Moric, Joseph. Timmermans, Joseph. Watson, David. Gwaii Haanas Park reserve and Haida Heritage site is an archipelago of 138 islands that lies 130km off the coast of mainland British Columbia; known simply as Gwaii Haanas, this area is protected as both a National Park reserve and an important Heritage site for the Haida First Nation. The islands are a very popular tourist destination due to the large temperate rainforests that house a vast diversity of animals.The Haida First Nation have a rich history on Gwaii Haanas, ranging back over 12,000 years, and even have a UNESCO World Heritage Site at one of the village sites on the islands. There is evidence of human habitation of these islands ranging back 13,000 years, the Haida are descendant from these original inhabitants and have developed their own distinct language and a complex social class system over that time. From this uninterrupted habitation of the islands, the Haida claim inherent communal rights to their traditional, ancestral, customary, and unceded territory, this claim gives them the inherent rights to sovereignty, self-governance, and the jurisdiction over this territory. During their 13,000 years of living on the islands, the Haida became skilled seafarers and traders, establishing many trade relationships with other first nations on the mainland of British Columbia. The islands were first encountered by Europeans in 1774 by Juan Perez from Spain, however they remained unclaimed and unnamed (by Europeans) until British Captain George Dixon claimed them for England in 1787 and named them after his ship, Queen Charlotte. The primary encounters between the Haida and the Europeans involved the trade of sea otter furs, until the populations collapsed from over hunting brought on by pressures from the Europeans; along with the trade came diseases that the Haida had never encountered before like small pox and tuberculosis. These diseases decimated over 90% of the Haida population (from over 7,00 to under 700), this decimation combined with pressures from involuntary assimilation, a new colonial government, and missionaries, forced the Haida to leave the majority of their villages and move to Old Massett and Skidegate Mission. After World War 1, the Canadian Government encouraged immigration to the islands in an attempt to ward off US expansionism and to "settle" the lands. Most of these actions committed by the Canadian Government were illegal, as the Royal Proclamation of 1763 recognized Indigenous peoples as “Nations or Tribes” and noted that they are not to be interfered with, and that they continued to own (although they could only sell it to the crown) the land they have used and occupied, these rights are also protected under Section 35(1) of the Canadian Constitution. 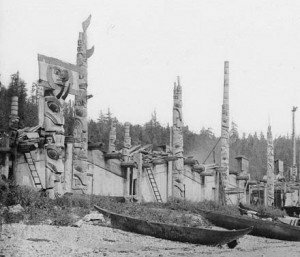 After World War 2, the fishing and logging industries both began to expand rapidly, numerous Haida used their traditional knowledge of the area to excel in these industries, especially in the fishing industry. The logging industry continued its rapid growth for decades, threatening to destroy important habitats for the species that live on the islands, and countless heritage sites for the Haida, this growth did not stop until the combined pressures of Haida blockades and international attention forced Canada and British Columbia to create the National Park and Haida Heritage Site in 1986. The international attention around the park reflects a growing effort to recognize Indigenous Rights and Title, including the International Labour Organization Convention 169, and the United Nations Declaration on the Rights of Indigenous Peoples, combined these recognize the individual and collective rights of Indigenous peoples to territorial, political, economic, development, cultural, environmental, civil and legal rights on their ancestral lands. Recently there has also been a shift towards combing the recognition of Indigenous Rights and Title with conversation efforts, and the Gwaii Haanas National Park, and Haida Heritage site is a prime of example of this shift in Canada. This National Park was the first one to be co-managed by a joint board of state and first nations representatives, the board must always contain 50% Haida membership to ensure that they have a voice in all the management processes. This co-managed system is often heralded as one of the best park systems in all of Canada. Map of Gwaii Haanas National Park Reserve, National Marine Conservation Area Reserve and Haida Heritage Site. The reproduction is a copy of the version available at Parks Canada, Government of Canada. Archipelago is crown land, designated, National and Marine Park reserves, with federal jurisdiction, National Parks Acts applied. There are many opportunities for travel and exploration of the park. Camping in Gwaii Haanas gives the feeling of being the first person to visit the land. There are no actual campsites, but stretches of sand and pebble beaches, that people can use as their own, with the expectation that the land be left the way it was found. Historically, Haida watchmen were situated at posts to warn their people of an approaching enemy. There is now a program funded by Parks Canada that provides employment to many Haida people of different ages, to act as watchmen, guiding tourists through attractions at the park and sharing parts of their culture with them. Marine mammal watching is another attraction of this park, providing people with the possibility of seeing the over 20 species of whales and dolphins along with sea lions. A key attraction at the Gwaii Haanas National Park is the 42-foot Gwaii Haanas Legacy Pole, carved in honour of the 20th anniversary of the Gwaii Haanas Agreement, raised on August 13th, 2013. Gwaii Haanas is widely considered an excellent example of co-management between indigenous peoples and the Government of Canada. The status of National Park-Reserve (NPR) provides the backdrop against which this management of Gwaii Haanas takes place, as it essentially allows for land claim disputes between the Haida Nation and the Federal Government to remain unsettled whilst ensuring National Park protection . Thus, NPR status creates a space for both parties to be involved in the management of Gwaii Haanas, and shifts the primary focus from conflict onto working towards common goals, despite differences in views of ownership. Though co-management arrangements are often seen as interim to resolution of land claim disputes, this case study will discuss its strengths and weakness by measure of its ability to facilitate successful and equitable management in light of the current situation of unresolved land ownership. Co-management has many definitional aspects. At the most conceptual level, co-management refers to arrangements between indigenous and non-indigenous people to share governance of a delineated area . At Gwaii Haanas NPR, it is the mechanism by which both Parks Canada and the Council of the Haida nation have agreed to protect the area and promote ecological integrity in the midst of unresolved land claim negotiations. This is not to say that co-management arrangements do not face their own set of challenges. As with any form of management, decisions are made based in certain knowledge frameworks. However, co-management between indigenous and non indigenous peoples often requires making decisions grounded in two distinct knowledge frameworks. Thus, a mutual respect for the knowledge that drives each system of management is needed in order for co-management to have success . The knowledge framework that has become increasingly widely accepted as that through which indigenous people conduct land management is called Traditional Ecological Knowledge – which can be defined broadly as dynamic local indigenous world-views, continuously integral to the local culture that govern all relationships between humans and nature . Houde identifies TEK as multi-faceted, including aspects such as “management systems, factual knowledge regarding past and current uses of the environment, ethics and values, and cosmology”, as well as being a key component of cultural identity . It is crucial to note that from a non-indigenous perspective, TEK is often seen as merely supplementary to western science. For example, science often critiques TEK for its spiritual component when spiritual explanations do not align with scientific ones. Furthermore, political power imbalances between Indigenous and non-indigenous mean that TEK can often be forced into a subordinate role to western science. Instead of mutual respect and acknowledgement of each framework, the political dominance of scientific knowledge can make what ought to be equitable co-management attempts into selective integration of TEK into existing scientific frameworks, at the discretion of non-indigenous scientists. . In other words, with the sovereign and executive power still largely in the hands of the state, the power dynamic is still hegemonic and recognition of TEK is arguably reduced to a new oppressive colonial tool .Therefore we must examine the political structures of governance in Gwaii Haanas to see the extent to which political power may be influencing the nature of TEK inclusion in management. The main manifestation of co-management is in the Archipelago Management Board. Made up of equal number of members from Parks Canada and the Council of the Haida Nation (CHN), the Archipelago Management Board holds the administrative and management authority in Gwaii Haanas . The AMB was a result of the Gwaii Haanas Agreement in 1996, and has since been the primary co-management mechanism of Gwaii Haanas. From a strictly numerical point of view, there is equitable representation on this level of park-reserve management . This does not necessarily ensure that use of Traditional Ecological Knowledge is widely apparent in the concrete management activities of the park reserve. Are the outcomes generated by the AMB in line with the principles of co-management? Thomlinson argues that according to the 5 principles of co-management outlined by the International Union for Conservation of Nature (IUCN), the AMB has had great success . The IUCN 5 principles include the following; 1) common objectives, 2) mutual understanding and respect, 3) decentralization and participation, 4) Equal benefits, and 5) cross-jurisdictional agreements. There is clear evidence that the first principle of the IUCN is being met, given the common goal of promoting ecological integrity . 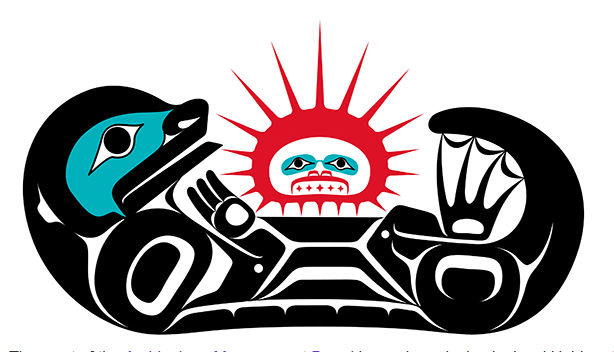 This can be seen in the crest of the AMB, the work of a local Haida artist depicting an otter and a sea urchin. Eradication of the otter during the fur trade brought about harm to kelp forests in Haida Gwaii, as sea urchin populations were left unchecked. The crest represents the commitment by the AMB to maintaining integrity in a vulnerable ecosystem . The second principle, mutual understanding and respect, is seen in the guarantee of Haida access for tradition subsistence activities. Despite the historical approach by Parks Canada of preventing any scale of harvesting within parks, there is a level of respect and understanding of Haida TEK such that these practices are guaranteed. Furthermore, both sides have committed to the prevention of commercial scale harvesting activities, and all traditional activities are reviewed by the AMB . Evidence of meeting the third principle of decentralization and participation can be seen in the Watchmen Program, a program initiated by the Haida people that places Haida Watchmen over ecologically and culturally critical sites as a measure of protection from and education of visitors. This is also a prime example of the application of TEK on a level that goes beyond the AMB. On a similar note, the fourth principle, equitable benefits, shows evidence of being met in the distribution of employment in Gwaii Haanas. Over half of park employees are Haida people, a fact that Thomlinson argues is beneficial to Haida communities and can be a source of respect for and within the Haida culture. Equitable employment in Gwaii Haanas is a direct result of the work of the AMB, which is responsible for the hiring . Finally, the principle of cross jurisdictional agreements is demonstrated as the boundaries delineated by Parks Canada and the Council of the Haida Nation differ and overlap in many areas, however arrangements such as the AMB work across these boundaries. However, one place where this principle of cross-jurisdictional agreements is weak is in the distinction between land and sea. The Haida make no distinction between the land of Gwaii Haanas and its surrounding waters, while Parks Canada identifies a distinct boundaries  This has the potential of being limiting for the co-management of the AMB when items fall outside Park-Reserve boundaries. By the measures set out by the IUCN, it appears that the co-management arrangement of the AMB has so far been a relatively successful one. Though there is room for improvement in some areas, the power balance on the AMB has allowed common goals to be set, TEK to be diversely applied, indigenous participation to be widespread, benefits to be shared and agreements to be made across jurisdictions . The Information provided in this section is based on one main source. This source is a detailed outline of the case of interest. This case summary is an example of the Haida locals integrating their values into government management of their marine ecosystems in order to continue accessing their vital resources, while helping the Federal government to conserve and maintain the unique biodiversity found in the Haida Nation. Marine co-management in Haida Gwaii is still progressing, and this summary will be highlighting and focusing on the discussion behind developing strategies that satisfy both parties involved. The summary will discuss the case of PNCIMA (Pacific North Coast Integrated Management Area), displaying its structure, and recognizing its strengths and potential points of conflict. This strategy of co-governance, although not always yielding a positive result, has been popular in the Haida nation for two main reasons. The first reason being that the BC government is constantly working to build partnerships with the aboriginal people to receive their support and extensive local knowledge in their projects, and reduce any tension between BC government and Haida people. The second reason is that this cooperation helps the BC government to promote conservation and the sustainable use of marine resources, which is also in the interest of the Haida in their efforts to preserve their culture. One motive behind the co-governance of Haida’s coastal and marine ecosystems lies in the potential ecological threats affecting Haida Gwaii’s coastal environment including “offshore oil and gas, commercial finfish aquaculture, marine transportation, climate change, introduced species, and bottom trawling”. These threats are particularly significant in the Haida nation due to the local dependence on the rich marine environment of Haida Gwaii. Marine resources are the main source of wealth through trading for Haida and therefore must be protected for the survival of the community. In the past, the BC government has exercised conservation methods in the area that completely disregard Haida values, excluding them from any access to the coastal resources. Although this effectively preserved the natural ecosystems, it damaged not only the economic strength of the communities, but also harmed aboriginal culture and values rooted in marine life and fisheries. This is where the PNCIMA excels, it is an efficient plan with the goal of including aboriginal input into further conservation efforts through co-governance of the territory. The PNCIMA incorporates First Nations input on an equal level to the input of the BC government without the resolution of treaties or land claims. Haida aboriginal cultural values are integrated into the marine use planning where they might otherwise be absent. These values are recognized to promote “sustainable, precautionary, and ecosystem based management of marine resources”. and “the PNCIMA governance framework provides an opportunity for ‘learning by doing’ that fits the geographic setting and socioeconomic conditions in the region”. This implies that changes can and will be made to the co-management plan if deemed suitable to aid the progression and otherwise benefit the parties involved in the plan. The PNCIMA was delicately planned in a way that makes co-governing favorable for both parties, this section will outline the strengths of the plan and how they were achieved. The method to unify all First Nation voices through representative meetings in the initiation process is a favorable component because it provides an opportunity for all planning areas within the PNCIMA to provide input to progress the integrated management. It is an effective way to overcome the debate surrounding outstanding claims to territory, and create a single voice from the First Nations to reduce complexity when representing Aboriginal people in government-to-government processes. Another strength in the unification of First Nation voices is that the values and approaches expressed by said communities will be consistent, yielding resource management decisions that lack conflict. With the participation of Aboriginal parties in marine management, the BC government can help to, instead of cut off access to coastal resources, introduce protection plans with a greater emphasis on sustainable fisheries practices. This will protect the natural biodiversity without crippling the main source of income for local communities. Due to the inclusive development of the PNCIMA, there are very few potential points of conflict, and solutions have been developed where possible conflict was recognized. There have been only two potential conflicts in the PNCIMA to date.The first issue was to regulate the multiple use of marine areas. If multiple parties collectively were to over exhaust a marine resource, it would cause environmental harm and be therefore unsustainable which counters the goal of the PNCIMA. Fortunately, this has not occurred, likely due to the low population, about 75 000 in relation to the large covered by the Pacific North Coast. With careful planning and regulation of resources, the communities affected by the PNCIMA will always have access to sufficient resources to sustain both the environment, and their economic development. The second conflict relates to boundaries created by Parks Canada separating land and sea territories. These boundaries may cause problems due to different laws on resource use between land and sea in certain areas. This could restrict the movement of Haida locals between ecosystems, and potentially cause conflict regarding land to sea transitions. In Conclusion, the objective of this case summary is to provide an example of Haida Gwaii inhabitants, specifically First Nations, successfully co-governing their marine ecosystems with the government of British Columbia. The structure of the PNCIMA is effective in including equal representation of both governments involved in the plan, and promotes conservation of the local biodiversity while allowing communities to continue to sustain their marine dependent economy. Although there are some weak points to the plan, they are firmly outweighed by the countless strengths of marine co-management. During the planning and execution of the PNCIMA, there have been many strong points including the representation of all First Nations communities in the governmental collaboration, and sustainable resource management methods. 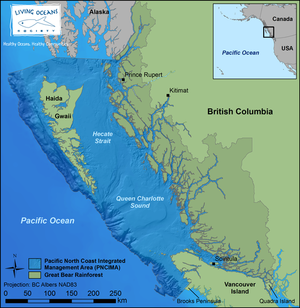 Overall, co-governance of marine environments on the pacific north coast have had positive influences on both the BC government and the First Nations peoples. In this section we invite scholars, students, and industry professionals to contribute their thoughts on the case study presented. The unresolved overlapping land claims to Gwaii Haanas National Park-Reserve between the Haida Nation and the Federal Government of Canada have set the stage for one of the most successful examples of co-management in Canada. The Archipelago Management Board ensures that the voices of both parties are equally involved in the management of Gwaii Haanas, and has proven itself to be successful in allowing common goals to be achieved despite overlapping claims. Both parties have been able to come together to promote ecological integrity and conservation of biodiversity in both terrestrial and marine environments. Co-management in Gwaii Haanas has also been effective in preserving Haida culture, and developing a positive relationship between the Haida Nation and Canada. While there are areas that can be improved, such as potential conflict stemming from differing views and legislation regarding land-sea boundaries, the Gwaii Haanas NPR is an excellent model of co-management and can provide valuable lessons for the future of park co-management. ↑ McNeil, K. (2007). The jurisdiction of inherent right aboriginal governments National Centre for First Nations Governance. ↑ Tennant, P. (01/01/1990). Aboriginal people and politics: The Indian land question in British Columbia, 1849-1989 University of British Columbia Press. ↑ 5.05.1 Stevens, S. (2014). Indigenous peoples, national parks, and protected areas: A new paradigm linking conservation, culture, and rights University of Arizona Press. ↑ 6.06.16.26.36.4 Borrini, G. (2007). Sharing power: Learning-by-doing in co-management of natural resources throughout the world Earthscan. ↑ 9.09.19.29.39.49.5 Thomlinson, E., & Crouch, G.(2012). Aboriginal peoples, Parks Canada, and Protected Spaces: A Case Study in Co-Management at Gwaii Haanas National Park Reserve. Annals of Leisure Research, (15)1, 69-86. ↑ 10.010.110.210.3 Doberstein, B., and S. Devin. (2004). Traditional ecological knowledge in parks management: A Canadian perspective. Environments 32(1), 1-22. ↑ Coulthard, G. (2014). Red skin, white masks: Rejecting the colonial politics of recognition. Minneapolis, MN: University of Minnesota Press. ↑ 14.014.1 Pinkerton, E. (1989). Cooperative management of local fisheries: new directions for improved management and community development. Vancouver: University of British Columbia.